The fact that this game genre began as a table-top card game in which the player not only held the cards in their hand but built decks and carried their weight in the game based upon factors like luck and wealth and the ability to purchase and collect the best cards originally made for rather unbalanced play. This was made all the more awkward by quirks in the card distribution system that actually created more rarity than there should have been, so that even when players were willing to spend money on the Booster Packs, they were still at a disadvantage against players who went online and cherry-picked their cards by purchasing specific ones in order to build killer decks. Gamers who either could not afford to pay for the very rare and powerful cards, or who were opposed to the practice under moral terms, were at a decided disadvantage. When the games made the digital jump and became video games the manner in which this leveled the playing field was heralded as a massive improvement by the larger player base (and decried as unfair by the players who had built those killer decks) as now the artificial rarity of cards was pretty much eliminated. Oh sure, when games allowed for trading of cards you still saw the Richie Rich players assemble their killer wallets - err - decks, but by and large it transitioned to a game of skill, where the most strategic use of cards and a firm understanding of basic strategy in play paid the most dividends. 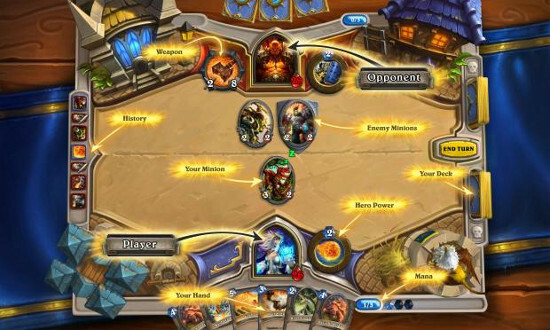 Hearthstone is set in the same universe that Warcraft takes place in, so a lot of it will feel familiar to you if you have already spent time playing in that universe. When you first start out and install the game if you do not already have an account you need to create one, that is important since the deck you build and your progress will be attached to that account. We say if you do not already have an account since if you have been playing Warcraft or a related game you may actually already have a Blizzard Account. When you put in your email address to create an account if you already have one it will tell you - but either way you need to login, so make one of you don't hav eone. After logging in you create your new TCG character by choosing the character class you prefer - a choice that will define what special cards you will have as well as the unique hero-power that will be available to you. You really should play through the tutorial since that will give you a fair picture of the different classes and which one(s) might appeal to you to play. The tutorial does a pretty good job of grounding you in the mechanics of play and a good notion of the different strategies that lead to victory. 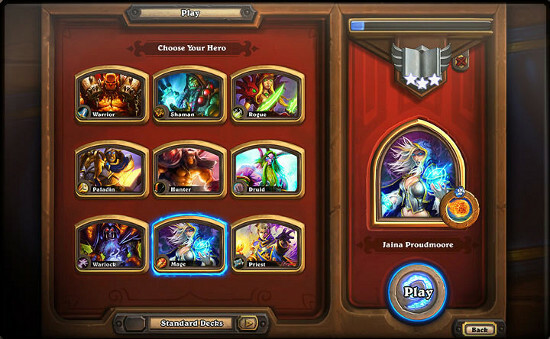 The game play deck consists of 30 cards, selected when the game begins, and played during each turn. The victory conditions are simple: you reduce the opponent’s health to zero and you win. They reduce your health to zero, you lose. Getting their health down to zero is accomplished through using your cards, which consist of minions, spells, and special condition/action events. For the tutorial phase the cards you use have been selected for you, but once you get into the proper game you will be building a deck of your own, and hopefully you will begin to accumulate in-game wealth in the form of in-game currency and better cards. All that is required to begin this journey is to build upon your knowledge of the game. Simple as that.